Deep Space 1 finds Comet Borrelly has [a] hot, dry surface. "The spectrum suggests that the surface is hot and dry. It is surprising that we saw no traces of water ice," said Dr. Laurence Soderblom of the U.S. Geological Survey. "We know the ice is there," he said. "It's just well hidden." For readers unfamiliar with the contact between the space probe "Deep Impact" and the comet "Tempel 1" which happened on July 4, 2005, here is a replay. The idea was to hit a comet with something massive, to see if comets really were "snowballs" -- as was suggested 60 years ago by Fred Whipple who coined the phrase "dirty snowball." The comets have been held to be distinct from asteroids and meteors (they are not), because there was no accounting for all the water on Earth without some extraterrestrial delivery system. After all, other planets and moons have no water or very little water. Earth has a lot. Only comets, on their wild orbits, could actually reach Earth. Additionally, it was assumed that the enormous tails of comets must be ice sublimating to water vapor due to the heating of the Sun (the sunward side of a comet may reach a temperature of over a hundred degrees Fahrenheit). This theory reached conviction when hydroxyl (OH) molecules were identified in the tails of comets, and remained in vogue even after it was recognized that the Solar Wind which shaped the glowing coma and tails of comets -- the long stretched-out streamers -- produced them by combining Solar Wind protons (H+) with cometary Oxygen (O-) ions released from silicates. Comets were also held to be "dirty," that is, covered by dust, because a comet consisting of ice or snow would reflect sunlight, and the icy material would never sublimate to form a tail millions of miles long. All of this consists of a picture drawn by an eight year-old. The comets become bottle rockets leaving smoke trails in space -- at times 100 million miles long (the largest objects in the Solar System), coming from an icy object less than a few miles across. At times there are dual tails, spikes pointing toward the Sun, tails moving away at right angles from the main body, and curved horns at the front. But most of these other displays have been neglected. How could a comet a few miles across form a coma as large as the diameter of the Sun -- 864,000 miles -- and a tail longer than the distance from the Sun to Earth? There is obviously something wrong with this description. What is even more wrong is the conviction that comets represent the coagulation of the dust of the primordial Solar System, and that these represent the formation of a planet or planets which had gone wrong. Never mind all the contrary data, the space probe "Deep Impact" was going to close in on the comet "Tempel 1," fire a 800-pound copper projectile at some 35,000 miles per hour, and record the sequence of events both from a camera mounted on the projectile and from the spacecraft "Deep Impact" passing by at a safe distance of some 800 km. It was fully expected that the projectile would penetrate the comet, or would start a new "sublimation" point which would gush water vapor into space for the next 1000 years. Neither happened. In fact, nothing happened to any expectations, and the community of researchers was left scrambling for new theories. Only a few people made correct predictions. They were based on very simple concepts: (1) comets are rocks, and (2) the interactions would be electrical. I made some predictions, first in March of 2005, when I became aware of the Deep Impact mission, which I posted somewhere on my site on July 3, 2005. I predicted that at best only a small crater would be made. NASA expects a crater the size of a football stadium, over 150 feet (50 meters) deep and 250 feet (85 meters) in diameter. I also predicted that most likely the disturbance of the comet's electrical field by the approaching probe would cause an inrush of electrons speeding ahead of the arrival of the probe, causing an explosive arc at the impact location well before the probe arrived, as a sudden lightning stroke from the comet to the probe, ending in a brilliant green flash as 800 pounds of copper were vaporized. Nothing quite as spectacular as the green flash happened, although the predicted pre-contact flash happened. Thornhill predicted the same thing (not the green flash) a day or two later, on July 5th. I do not need to claim primacy, however, because the flash would be completely predictable from an electrical standpoint. Thornhill rightfully took some pride in predicting the pre-contact flash, and the world's media descended on him in the week after the mission. But as soon as he was identified as a Velikovsky follower, all interest evaporated, and the media packed up. This may have turned Thornhill from ever again wanting to be associated with the name of Velikovsky. But here also was a missed opportunity, for to have been able to tell the media that what happened was so obvious that any number of electrical engineers, physicists, or astronomers would have arrived at the same conclusion. This would have ameliorated the Velikovsky contamination. I should also point out that a brilliant object in space traveling toward a spaceship had happened before. I recall an incident where a spacecraft, on approaching a moon (a planetary satellite), recorded what looked like a missile traveling at high speed from the moon. The space ship lost radio contact a second later. I need to find the source for this. "Let me hedge my bets: If the probe makes contact with the comet, that is, if it makes a splashdown, it will provide a large blotch of copper to act as future site of any of the sporadic bursts of plasma that the comet now undergoes periodically." Wrong again, sort of. What actually happened went completely beyond all expectation. "It is also possible that no significant fireworks display will be seen. Comet Tempel 1 comes to perihelion outside of the orbit of Earth, and originates from the space beyond Jupiter. Its charge is likely to be mostly equalized to the local electrical field of the Sun, as can be seen from the small jets of plasma which are only sporadically emitted." "But I can certainly predict expected mainstream reactions." "In the event of a small impact crater, NASA will come up with a new theory of super-hard ices in space, or suggest a 10-foot-deep impenetrable crust of solidified rock." "If the copper-coated impact area becomes the favored location of new flares, it will prove to NASA that the comet is 'outgassing' at a new location, and probably due to an assumed deep hole made into the ice." "A flare-up of the comet before impact will suggest a slight mishap, to be cast in terms of, 'An unexpected disruption of subsurface ice exploded in the direction of the probe, due to gravitational shock waves, gravitational eddy currents, gravitational inequalities, gravitational tidal forces.' [joke]"
Added note: This was a joke, but two months later NASA is suggesting that perhaps the other marks on the comet, which are normally assigned to impacts, might be due to underground "icy volcanic eruptions." "We will again be left with nothing proven. Stay tuned." That turned out to be correct. 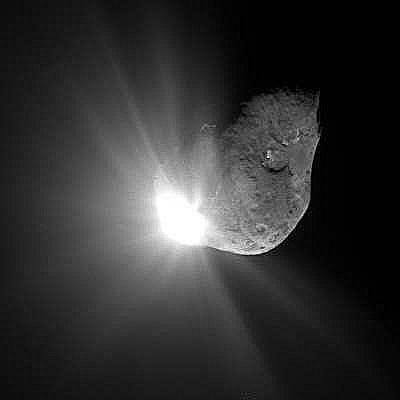 On July 3rd, 2005, a day before the impact, the Saturnian Group also made some public predictions for the impact of the 800-pound projectile fired at Comet Tempel 1. See the TPOD by Wallace Thornhill at [thunderbolts.info]. "The most obvious [result] would be a flash (lightning-like discharge) shortly before impact." I should point out that this prediction was the most radical and interesting, and the one which rushed the press to Australia. But they dispersed as soon as they learned that Thornhill would base his prediction on the theories of Velikovsky. A later web-based blog called the Thunderbolts.info "a crank web site set up primarily to sell crank books." More obvious comments on this further below. "More energy will be released than expected because of the electrical contributions of the comet." "Copious X-rays will accompany discharges to the projectile, exceeding any reasonable model for X-ray production through the mechanics of impact." "Any arcs generated will be hotter than can be explained by mechanical impact. If temperature measurements are made with sufficient resolution, they will be much higher than expected from impact heating." "The discharge and/or impact may initiate a new jet on the nucleus (which will be collimated -- filamentary -- not sprayed out) and could even abruptly change the positions and intensities of other jets due to the sudden change in charge distribution on the comet nucleus." "The impact/electrical discharge will be into rock, not loosely consolidated ice and dust. [this restates the above] The impact crater will be smaller than expected." Van Flandern's predictions were absolutely correct -- based on his conviction that comets are rocks. Van Flandern does not allow for electrical interactions, which ended up widening the "impact crater" and heaved into space an incredible amount of fine dust. "In brief, there is a general expectation that the impact will be gravity-dominated, while respecting the possibility that it might be strength-dominated. Either result will be argued as supporting the dirty snowball model for comets, even though the latter implies that the comet has been heavily processed and is not primordial." "Just as Kuhn predicts for the nature of paradigm shifts, [T.S. Kuhn, 'The Structure of Scientific Revolutions' (1996)] one model will not overthrow the other on merit, but the incumbent model will be patched until it so closely resembles the competitor that no important distinction remains. That helps to maintain the illusion that the progress of science is always forward." [July 5, 2005:] The first observations of July 4th, from a number of sources, compared with predictions as listed above. "... at best only a small crater would be made." Although difficult to measure, a NASA spokesperson suggested "at least bigger than a house," that is, 30 feet (10 meters) in diameter -- not 250 feet. This changed soon, for as soon as the impact crater was made, electrical arcing started up at the edges. Over the next few days this would enlarge the original crater to form a shallow depression as the electrical arcing wore away material from the sharp edge. Thus the original suggestion of a crater the size of a house was soon modified to suggest that it was much larger. 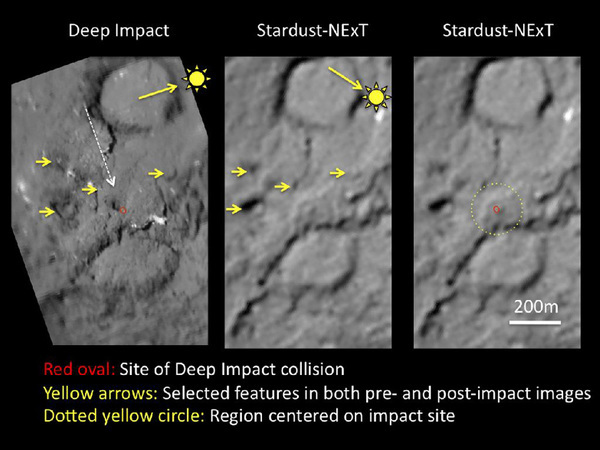 "an explosive arc at the impact location well before the probe arrives ... followed by a sudden arc from the comet to the probe"
The initial flash at the impact point was bright and small -- and of only 50 milliseconds duration -- and separate from a secondary conical blast of material. I have no idea of the timing of this bright spot, that is, when it first appeared. The probe was to take images every 2 seconds until impact, but the last image was transmitted 3.7 seconds before (calculated) impact. I would suggest it was "hit" at this time. The probe was traveling a little over 6 miles per second, with 24 miles to go before impact. The probe also faltered twice in earlier transmissions during approach. It would suggest electrical disturbances, that is, plasma sheath shielding (mentioned as likely by Thornhill). "... ending in a brilliant green flash as 800 pounds of copper are vaporized." That was my suggestion and I was dead wrong about that. I admit that I never took note of the approach speed -- which was on the same order of magnitude as for a meteorite strike to Earth. I was actually surprised that this speed was attempted, because for objects in space the speed of impact is determined by the escape velocity of the larger object. For Earth this is 25,000 miles per hour. For the Moon this is 5,000 miles per hour. For smaller objects it is much less. For an asteroid sized comet this would be only a little more than nothing. Also, I have seen nothing more anywhere of all the copper molecules which should have been part of the initial impact explosion. "... [the copper molecules] will provide a future site of any of the sporadic bursts of plasma that the comet now undergoes periodically." After the initial flash, material was noted as being ejected straight up in a column. That is certainly not the mark of impact ejecta; it is the mark of a cathode strike. This was correctly predicted by Thornhill. NASA would suggest later that this meant that the probe bored a deep hole in the snow and ice, like a well or a gun barrel, which "shaped" the initial ejecta. A conical ejecta started after the initial appearance of the column, and became increasingly larger with time. Although this could be understood as a large and deep hole made in the surface, it could also be a shallow crater whose size is progressively being enlarged by electrical sputtering at the edges of the crater. The conical ejection seemed to be sidelit by the Sun. We will have to see if this stops or continues. Thornhill was certainly correct in this. Van Flandern did not anticipate this, because there was no electrical interaction presumed. The sustained burst after impact amazed all the researchers. They have had to go to extremes to explain it. No mention has been made yet of spectral analysis. As with Halley's Comet in the 80's, an X-ray source will be identified, and then simply neglected. "In the event of a small impact crater, NASA will come up with a new theory of super-hard ices in space, or suggest a 10 foot deep impenetrable crust of solidified rock." NASA has in fact suggested the opposite, namely that the probe hit a soft outer layer before being crushed (in actuality "vaporized") by deeper harder material ("ice"). The suggestion follows from the massive conical "flare" which appeared and enlarged after impact. "Because the impact area is in sunlight and thus facing the Solar Wind of incoming protons, more water molecules will be produced by combination of protons with the oxygen ions than what is normally found in the outer reaches of the tails of comets." Did I say this? This clearly has turned out to be untrue -- much fewer water molecules were being produced than expected. "The discharge and/or impact may initiate a new jet on the nucleus and ... could even abruptly change the positions and intensities of other jets." It was initially claimed that the relocation of jets did not happen. It was later claimed that the relocation of jets did happen. Actually, no one took note of any of this, for it was certainly not a concern of the accepted model of a comet. But the intensity remained the same. Two weeks later the comet had returned to the sporadic bursts of plasma which it exhibited before the impact. NASA kept talking of snow and ice in their press releases. Other sites investigating the impact had other things to say, at times in contradiction. The first images returned from the Deep Impact flyby spacecraft showed a small fireball followed by a much larger, incandescent flash that engulfed one end of the comet Tempel 1. Observatories on the ground reported that the explosion brightened the comet by a factor of five within 15 minutes of impact. It is really strange how the flash expanded quite slowly -- as if the edges of the crater were on fire. But this is entirely expected as an electrical phenomenon. The impact sent up twin plumes of debris, the first appearing as a narrow column that cast a long shadow across the comet. Another plume appeared seconds later on the heels of a brighter explosion, then fanned out in a star shape. A comet is composed of two parts, the larger coma, seen in glow-level plasma discharge, and the rocky interior, called the nucleus, which is the source of the coma. The initial plume was probably the ionization of the trajectory of the impactor, made visible with a glow-discharge plasma expulsion. It was not impact debris, which would create a spherical expulsion of material. Scientists studying the Deep Impact collision using NASA's Swift satellite report that comet Tempel 1 is getting brighter and brighter in X-ray light with each passing day. That was just totally bogus. X-rays are produced by intense concentrated electrical arcing, and not by interaction of the ionized material with the incoming Solar Wind, which only interacts at the limits of the coma, not by dust locally lifted into space. One source, looking at the ultraviolet flash, says the impactor hit a hard surface. NASA and related sources assume a soft surface on the basis of the dust cloud. One source discounts any increase in water vapor after the impact. NASA still holds that ice was hit. NASA and others are surprised at the fine powder lifted into space by the impact. They had expected coarse-sized debris as would happen if the cloud were ejecta from an impact. Many sources were completely surprised at the size of the flash, assuming this to be volatilized material -- supposedly water vapor, and the fact that it continues unabated a week later. One source has identified the "ejecta" as composed of silicates -- ground up rock. NASA has been mum on this. Any number of sources assume that the X-ray production is caused by the Solar Wind impinging on the "dust." It is an interaction with ions and electrons. The preliminary flash and the subsequent plume which rose straight up remain unidentified. The size of the crater remains small despite the fact that enormous amounts of material are being lifted into space (into the coma). The only news is that NASA now claims that the comet was covered with "cosmic talc" which would account for the gigantic -- and totally unexpected -- clouds of "dust" after the impact, which subsided after a few days or a week. NASA still does not know the size of the crater, guessing at 150 to 750 feet (250 meters). Apparently the crater size has increased, as expected, from the initial guess of 30 feet (10 meters). The relocation of the periodic bursts to the impact site has not happened. The ESO reports: The flare only lasted a few days, and two weeks later the comet had returned to its earlier intermittent flares, at old locations. The ESO also claims that the impact "has failed to free up a large quantity of untouched material from beneath the surface." Meanwhile, Thornhill has posted a summary of findings at [www.holoscience.com/news.php?article=3kneumjj] and [www.thunderbolts.info/tpod/2005/arch05/050719deepinterim.htm]. Thornhill also suggested (in a previous post) that NASA is rapidly forgetting things -- like the initial flash, and the magnitude of the blast of light. This last is being turned into "sunlight reflecting on fine dust" rather than the more obvious "electrons in a state of high excitation." Of course the fine dust will be there as the initial cathode strike sputters solid rock into tiny fragments -- but so will the electrons and ions. Thornhill also mentioned that data is being removed from NASA websites. (November 2012) I have removed all the original quoted source material, because there was such a surplus. But I have retained the comments these generated. "Keeping it anchored" (originally in the removed quoted) is a typical iffy phrase. To the researchers the cloud is a glob of dust anchored to the comet. They cannot imagine how it is held in place after being ejected. The forward speed of the dust should have released it entirely from the gravitational grip of the meteor. The plasma people understand it differently. The particulate matter is ionized silicates -- electrically charged rock dust. The particles are electrically repelled from each other, and therefore spread away from each other. That accounts also for their initial leap off the surface. But at the same time they are attracted to the negatively charged surface of the meteor and continue to hover. The "strange behavior" of a very weak gravity, the "gluing together" of microscopic dust particles, the assumed "baking" by the Sun, the older impact sites which show only slight indentations to the "soufflé" surface, the "shock wave" which took five minutes to travel 50 yards, a plume of dust "anchored" by gravity, the suggestion of "icy volcanic eruptions," the deep penetration hole [presumed to be 90 feet deep] which has yet to be seen, and the repeated equipment failures -- these all speak of soufflé science. It is interesting that diverse readings -- the plasma version and the dirty snowball version -- could be extracted from the same data. Yet all the data is there. The snowball version, however, lacks any substantial physics; the concepts are constantly undercut with inexplicable "surprises." I have a fair suspicion that NASA knows damn well that the projectile hit a giant rock, not a pudding of mushy snow, that the fireworks were an electrical explosion, and that the cloud of "dust" was rock which had been vaporized in the electrical explosion. But this information should not enter the public domain, because it will cause unneeded anxieties. If people knew that comets indeed consist of solid rock, and additionally are capable of exploding electrically, there would be panic about what would happen if a comet ever approached Earth. The earlier idea of, "we'll just nuke it," would have to be removed from consideration if comets are solid rock and if we get the sort of energetic reaction that we have just seen with the impact of a mere 800-pound chunk of copper. Retaining the idea that comets are just cotton candy keeps them nukable, makes everyone feel confident that we can control these objects, and extends research funding for NASA. "The first results from NASA's Stardust mission are in, leaving mission scientists in a state of shock and awe. The tiny fragments of comet dust brought back to Earth [anorthite, forsterite, and other silicates] did not accrete in the cold of space, but were formed under 'astonishingly' high temperatures." The stuff consisted of silicates -- rock dust. Official papers were published in Science in 2005. In the book The Electric Universe (2007), Wallace Thornhill and David Talbott elegantly sum up the evidence of the two positions I mentioned above -- that comets are rocks, and that the interactions will be electrical -- for Comet Tempel I and for 15 years of space research (along with other Electric Universe aspects). In February of 2011, NASA has rerouted a spacecraft to take another look at Tempel 1, now six years since the impact by Deep Impact. The inspection tour was known as the Stardust-Next mission. The area of the 2005 impact was photographed, and did not show what was originally thought to be a 90-foot deep hole the size of a football field. It is hard to tell, for although NASA claims that there is a depression of 150 to 250 feet (50 to 85 meters) , there is no shadow and no show of any depth. Representing NASA, Peter Schultz claimed "We see a crater with a small mound in the center..." I see no crater at all. But then Schultz goes on to explain this as "some of the ejecta went up and came right back down." And then comes the soufflé conclusion reached by Schultz, "This tells us this cometary nucleus is fragile and weak based on how subdued the crater is we see today," but in complete contradiction to all previous theories offered by NASA. Ratcliffe wrote at one time: "theories from the secret minds of tadpoles." Size of this page: 5160 words.